You’ve winced when you’ve heard bad audio. If ears could squint, yours have done it trying to make out what was said, and poorly captured. Sometimes background noises overwhelm what you should hear. Sometimes you hear breaths and pops and snake-hissesses. Sometimes it’s mic squeals and papers rustling on the music stand. Those disruptions are all avoidable. Somebody should have put their foot down and insisted on more takes, the right mix, and audio mastering. That’s where CreativeDrive’s Audio Production Services comes in. Our professional audio engineers are experts in their craft. They will record, mix, and master your recordings to perfection, so your messages get heard (and understood) loud and clear. From script writing to voice casting, from directing talent to nailed-it takes to choosing the perfect track of background music, from recording to editing to enhancing to mixing to getting your mastered audio file everywhere it needs to go – our Audio Production Services can handle every step in your audio projects. While it uses many of the same tools and techniques as mastering, Audio Mixing is earlier in the process, and is the combination of elements: instruments, voices, sound effects, echoes, reverbs, and more – all elegantly blended together. The final step in audio post-production, Audio Mastering uses equalization, compression, limiting, and stereo enhancement to balance sonic elements and optimize playback for all listening environments. Think about the variety of devices and speaker systems your family uses: headphones, earphones, ear buds, laptops, cell phones, car and boat stereos, portable speakers, clock radios, home entertainment systems, and many more. But when your recording is balanced and mastered perfectly, none of that matters; your message is clear – on every device. This keeps listeners listening, shoppers shopping, consumers consuming, buyers buying. Complex systems’ audio design ensures instrumentation is split across channels for the richest listening experience. 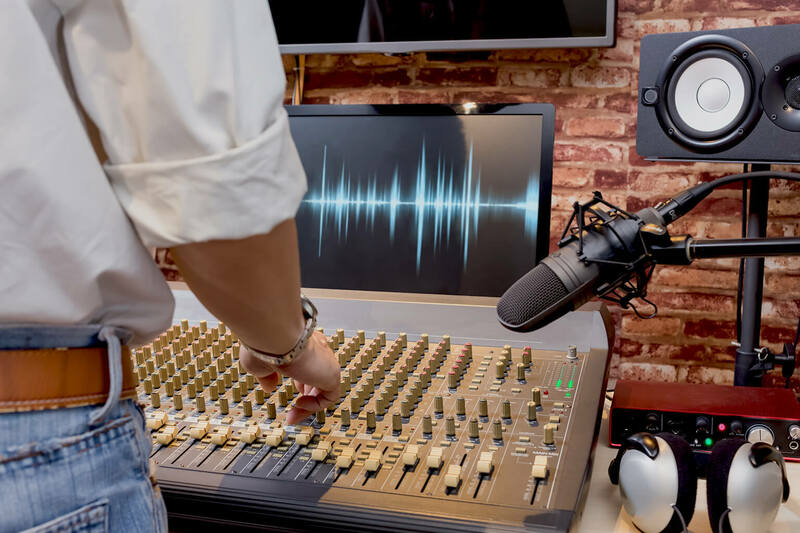 But for small speakers, or cell phone speakers, a mixed-down mono-track works better, minimizing static and feedback, and in the process, helping protect your consumers’ devices. If your business is hosting a live event or a presentation, a console that can equalize tracks’ channels ensures the audio sounds great on large professional speakers, or on tiny wimpy ones. We bring the best of tradition into tomorrow. The talent of a professional musician. The craftsmanship of a perfectly constructed script or melody. The delivery of a compelling voiceover, with spot-on accents, contagious energy, and impeccable pronunciation. We honor these timeless skills, coach and guide them, and capture their performances. Then, enhanced with latest in technology, we mix, mesh, meld, and master, all of it working together to provoke action, all so your brand can reap the benefits.